Meet MMHS Board Member Bob Nay and learn why he loves Mandarin. Bob, retired from Florida Blue, has been very active in all museum events. “I am a Full-fledged Floridian Now: The Life and Times of Major William Wirt Webb of Mandarin, Florida,” Bob’s wonderful book, is available in the Mandarin Museum gift shop. “The site of Major William Wirt Webb’s farmhouse has been an appealing physical structure and place to me, but, more importantly, is the personal attraction I have had to Major Webb and his family. I really enjoy sitting on the porch steps of this 1875 farmhouse that Major Webb built, and taking myself back to the 1880s. Looking out toward the St. John River, one can imagine the orange trees and strawberry plants covering the farmland. And even better would be sitting there with friends sharing some strawberry shortcake, or peeling a fresh orange, and talking with friends and neighbors about the comings and goings in the village of Mandarin. These friends could even include Harriet Beecher Stowe and her husband Calvin, neighbors Leopold Parker and John Williams, carpenter/builder Bill Monson, Dr. Wright, Charles Read, the Brown family, and many more of the early Mandarin families. Our discussions could range from the next steamship scheduled to come into Webb’s wharf, or Webb’s own freight schooner, to the building of the Church of our Saviour just down Mandarin Road, to the weather, or just plain sharing of the latest news and stories (like what really happened to the Maple Leaf that was torpedoed in 1864). Major Webb was a stranger to me, and is to many of today’s Mandarin citizens. Being myself from the North, a military veteran, and having a strong interest in the Civil War, I became personally interested in this stranger – Major Webb. 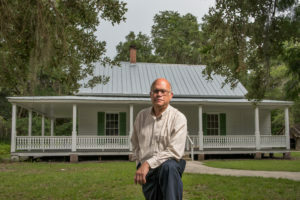 He himself was initially a Yankee stranger to Mandarin, well educated, served honorably as a Civil War cavalry officer, and became a well-respected Mandarin resident. Along with the Stowes and others in Mandarin, he was a significant factor in the building of the Church of our Saviour, and the Mandarin community. In my research about Major Webb, I found a letter from Wirt Webb (as he was called) to his sister Lady Camilla van Havre in London in 1875. One of his sentences that struck me was: ‘I am a full-fledged Floridian now.’ Many times I think of my hometown as being in Pennsylvania and Ohio where I grew up many years ago. But after forty some years in the Mandarin area, I also feel like ‘I am a full-fledged Floridian now, and not a Yankee stranger.’ After personally discovering him, I thought in a way I had adopted Major William Wirt Webb, until someone told me that he most likely has adopted me!